http://www.jewishworldreview.com | Do the bad guys  the terrorists in their Afghan caves and Iraqi redoubts  want George Bush defeated in this election? Bush critics, among them the editors of the New York Times, have worked themselves into a lather over the mere suggestion that this might be so. A front-page "analysis" in The Post quoted several Republican variations of this theme  such as Deputy Secretary of State Richard Armitage saying that the terrorists in Iraq "are trying to influence the election against President Bush"  then noted that "[s]uch accusations . . . surfaced in the modern era during the McCarthy communist hunt." Intimations of McCarthyism constitute a serious charge. But the charge is not remotely serious. Of course the terrorists want Bush defeated. How can anyone pretend otherwise? Why are we collectively nervous about terrorism as the election approaches? 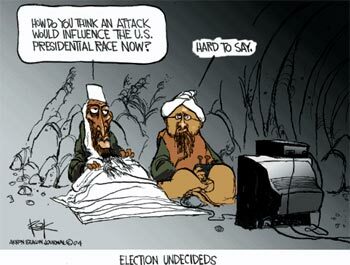 Because, as everyone knows, there are terrorists out there who would dearly love to hit us before the election. Why? To affect it. What does that mean? Do they want to affect it randomly? Of course not. We know the terrorists' intent and strategy. We saw it on display in Spain, where a spectacular terrorist attack three days before the national election set off the chain of events that brought down a government that had allied itself with the United States. The attack worked perfectly. Within weeks Spain had withdrawn its troops from Iraq. Last month, terrorists set off a car bomb outside the Australian Embassy in Jakarta, Indonesia, in the middle of a neck-and-neck Australian election campaign and just three days before the only televised debate between the two candidates. The prime minister, John Howard, is a staunch U.S. ally in both Afghanistan and Iraq. His opponent, Mark Latham, has pledged to withdraw Australian troops from Iraq by Christmas. The terrorists may be medieval primitives, but they know about cell phones and the Internet and fuel-laden commercial airliners. They also know about elections. Their obvious objective is to drive from power those governments most deeply involved in the war against them  in Afghanistan, Iraq or anywhere else. The point is not only to radically alter an enemy nation's foreign policy  as in Spain  but to deter any other government contemplating similar support for the U.S.-led war on terrorism. But Spain and Australia  Britain, with Tony Blair up for reelection next year, will surely be next  are merely supporting actors. The real prize is America. An electoral repudiation of President Bush would be seen by the world as a repudiation of Bush's foreign policy, specifically his aggressive, preemptive and often unilateral prosecution of the war on terrorism, most especially Iraq. It would be a correct interpretation because John Kerry has made clear that he is fighting this election on precisely those grounds. Does this mean that the bad guys want Kerry to win? Michael Kinsley with his usual drollery ridicules the idea by conjuring up the image of Osama bin Laden, "as he sits in his cave studying materials from the League of Women Voters," deciding to cast his absentee ballot for the Democrats. The point, of course, is that the terrorists have no particular interest in Kerry. What they care about is Bush. He could be running against a moose, and bin Laden and Abu Musab Zarqawi would be for the moose. How to elect the moose? A second direct attack on the United States would backfire. As Sept. 11 showed, attacking the U.S. homeland would prompt a rallying around the president, whoever he is. America is not Spain. Such an attack would probably result in a Bush landslide. It is still prudent to be on high alert at home, because it is not wise to bank on the political sophistication of the enemy. The enemy is nonetheless far more likely to understand that the way to bring down Bush is not by attack at home but by debilitating guerrilla war abroad, namely in Iraq. Hence the escalation of bloodshed by Zarqawi and Co. It is not just aimed at intimidating Iraqis and preventing the Iraqi election. It is aimed at demoralizing Americans and affecting the American election. The Islamists and Baathists in Iraq are conducting their own Tet Offensive with the same objective as the one in 1968: to demoralize the American citizenry, convince it that the war cannot be won, and ultimately encourage it to reject the administration that brought the war upon them and that is the more unequivocal about seeing it through. It is perfectly true, as Bush critics constantly point out, that many millions around the world  from Jacques Chirac to the Arab street  dislike Bush and want to see him defeated. It is ridiculous to pretend that bin Laden, Zarqawi and the other barbarians are not among them.